On April 27th, Duelyst will finally be leaving its beta phase in favor of a 1.0 label. Counterplay Games announced the news today along with a brand new anime-style cutscene that will play when you launch the game, embedded above. It's no secret that I'm a big fan of Duelyst. The game has been in a good state since it entered open beta back in October. I got a chance to speak with the studio last week about what the transition means for Duelyst. Counterplay's Emil Anticevic told me that leaving beta may be more of a symbolic change than anything else, saying "we're the only ones still calling it beta." Anticevic pointed out that "the community doesn't treat it like a beta," and that at a certain point that label starts doing more harm than good. "We've been mostly feature complete for the last month," Counterplay's Keith Lee told me, saying Counterplay has already been working on two separate expansions for a while, but that they "can't release an expansion before we've launched our game." Functionally, not much will change when Duelyst officially leaves beta, but Anticevic and Lee told me there will be a lot changing in the weeks leading up to the 27th—as evidenced by the rather radical adjustment made just last week which means all players now draw one card per turn instead of two, but start with a hand of five instead of three. When we spoke last Monday, Lee told me we were going to see "some pretty dramatic changes" in the next few weeks (prior to the game's official launch) and that last week's patch was a significant part of that, but more (including balance changes to adapt to the new rules) may be on the way. And the changes and updates won't stop when the beta ends. "We have a couple new playmodes that we're excited to explore," Lee said, "but that might be a little bit after launch." In addition to continued patches, Duelyst will still to get four new cards at the end of every ranked season, and balance changes as needed. So far Counterplay hasn't been afraid to make changes to unbalanced cards, and Lee said they "definitely want to reduce" the amount of changes they make while in full release, but they won't remain hands-off if something is causing an issue with game diversity. "We believe our game is still a living game, and so we will make balance changes, more so than not doing them," Lee said, "so we will be a little more aggressive than probably other companies around that stuff." I also asked about a potential 2v2 mode and Lee said "there's something we're exploring right now that will require you to do stuff together with friends," and that they were looking for ways to let you play Duelyst that aren't so strictly "adversarial"—a tough task in what is, as of now, almost entirely a PvP game. Antivec followed up by saying "it's unlikely it would be a change to the way you play Duelyst," but it sounds like their solution might not mean 2v2 as of now, as he made it clear they were exploring a lot of different ways to approach the problem of playing with friends. "If you're in an office, maybe that means we all get together and play a tournament. If you have a bunch of friends all over the world, maybe you work towards a common goal. There's a lot of different dimensions to it—or maybe you play together on the same board, or maybe you don't." With more cutscenes, expansions, new playmodes, and a lot more on their plate, it sounds like Counterplay is going to be busy with Duelyst long past its launch on the 27th. 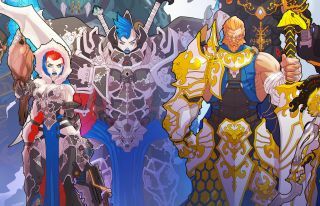 You can try Duelyst for free right here while its still in open beta—though it will remain free-to-play afterwards as well—and be sure to check out our primer for new players.